"I think this is her moment," Monica's cousin and longtime manager says of the singer, above. 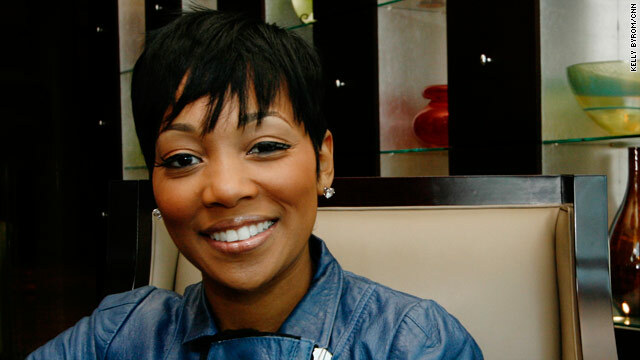 Singer Monica has a new hit reality show on BET, "Monica: Still Standing"
(CNN) -- At first, R&B singer Monica wanted no part of reality television. "I assumed [producers] would not want a reality show about my life as it really is, because my life is drama-free now," said the Grammy Award-winning artist. "If they wanted drama, they would have had to have caught me 10 years ago." The singer, whose full name is Monica Denise Arnold, has overcome some terrible experiences. She witnessed the suicide of a despondent boyfriend and was involved with rapper C-Murder (whose real name is Corey Miller and who is the brother of rapper Master P) when he was arrested for the shooting death of a fan. But those times are now behind the mother of two young sons. She's happily settled in a committed relationship with her children's father, rapper Rocko, and currently starring in the BET show "Monica: Still Standing." A new album is set to be released in the new year. While she's had success with singles like "Don't Take It Personal (Just One of Dem Days)," "Angel of Mine" and her duet, "The Boy Is Mine," with singer Brandy, the 29-year-old is looking to break through to superstar status. "I think this is her moment," said her cousin and longtime manager, Melinda Dancil. "People have seen 'the artist Monica,' but they have never really seen 'the person Monica,' and the person Monica is really what creates her engaging personality." The singer is quick to point out that "I'm not a victim, I'm a victor," and said she wants her legacy to extend beyond just her reputation as a singer, songwriter and occasional actress. She spoke to CNN about her career, why you won't see her in a catfight with another female singer and what makes her emotional. CNN: What do you hope fans take away from your new reality show? Monica: My main objective is to show some form of strength. I think people experience a lot, especially in this day and age, and especially young people, and people don't normally speak directly to them. I think they will take the idea of strength, the idea of faith and the idea of family away from it. The latter two are things that people don't like to talk a lot about or deal a lot with, in my experience. CNN: At what point are you in your career? Monica: I'm at the point in my career where it's time for me to start defining who I am as an artist. I would love for people to look at me as a great singer, but also know exactly who I am, the way that we have loved and respected people like Gladys Knight and Patti LaBelle having gone through the different stages of their lives with them. That's the type of history I want to have. This is the defining moment where I separate myself from others by whatever it is I do and the way that I do it. CNN: There was a moment at the 2009 BET Awards where you and Keyshia Cole performed [the duet "Trust"]. You came out singing, and the camera went to Beyonce in the front row where she was grooving. What is it like to perform for your peers, some of whom may not have been in the business as long as you have, but who may have greater recognition? Monica: You know, I don't think about it a lot. I look at it like this: They work hard, so I know they want to see great entertainment as well. Any time I perform in front of my peers, I think about it that way. I think about it the same way I do as when I am out on stage in front of a lot of people I don't know. You give 120 percent, make sure you do your absolute best and try to make sure each performance is memorable. CNN: What don't your fans know about you? Monica: I talk a lot about strength, faith and love, but I don't ever talk about the fact that I am one of the most sensitive people in my family. That might be the most shocking, because you always see me fighting the good fight, with the strong face on, but I am the most emotional. CNN: What makes you emotional? Monica: (Chuckles) Anything. I don't like to see children hurt or in need. I don't like to see people troubled or without, I don't like to see death. Some things make me emotional in a good way. When my son does well in school, I get real emotional because that's a testament to what I'm feeding him at home on a daily basis as far as knowledge goes. I wasn't so emotional until I had my first son. CNN: You gave up your teenage years to your career. Any regrets? Monica: None. I still love it. I always tell people that the music industry may be frustrating sometimes, but the singing never gets old. It's something I grew up doing, and I take the bitter with the sweet. CNN: What's frustrating to you about the industry? Monica: It's frustrating to me to see how much they force people to compete. It's not a competition. What is for me is for me, what's for you is for you. You can't constantly make these artists feel like they can't like each other or enjoy each other or do songs together because one is from this place and the other is from another. I think it's foolish.